It seems that our holidays coincide with escaping from the cold Perth winters. Yes I said cold – we do get below 5 degrees here and yes jackets are essential!! Last month we had the pleasure of discovering California in the summer. Getting to anywhere that isn’t South East Asia is an epic journey. 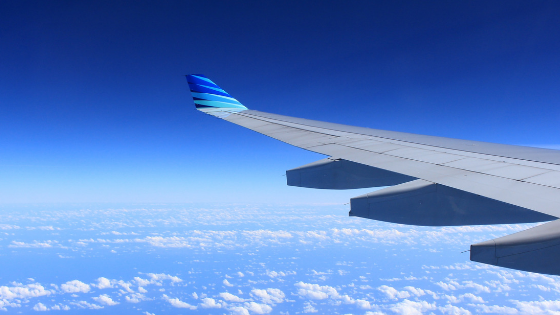 Our combined flight time was 22 hours each way, not including stopovers, delays, getting to the airport, getting to the hotel… the joys of travel! So finding ways to cope and maintain our sanity was important! The excitement of food, no internet access and endless TV and movies started to wear thin. My lower back was tight, sternum felt compressed and all I wanted to do was lengthen my spine and twist my insides. 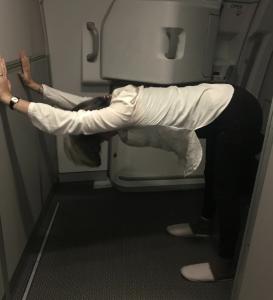 Movement in a plane is limited at the best of times – so a full round of sun salutation A was not going to go down well with my fellow travellers. Enter the friendly flight attendants! After meal services we’d sneak into their kitchen area to move our bodies. My first move? Forward bend to let my spine waterfall forward and decompress – bliss! 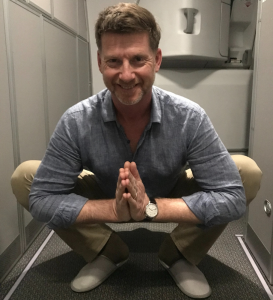 Hands sitting on top of my feet (I’m a germaphobe so no hands on ground happening here! ), knees bent to give my tight hammies some relief. And then it was time to get creative with the props available! Hips need some loving? Always enough space for malasana (yogic squat)! How about testing that balance miles above the earth, little bit of wobble to fire up the core muscles? 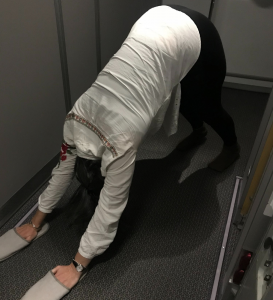 And my favourite downward dog modification – using the wall! But the fun didn’t stop there! Back in the chair, more forward bends and then some twists – binding to make sure there were no elbows where they shouldn’t be. Where we’d love to see you too! 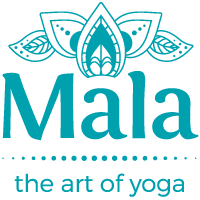 So you can learn asana (yoga postures) to keep your energy flowing and body feeling great as you move through life. 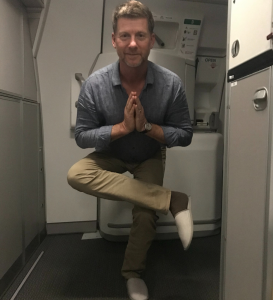 We’d love to know your favourite travel asana – leave us a comment in the box below! Hello and thank you for your regular reminders about what we should be doing for ourselves. Myself and my wife Claire, more than a year ago now (at least) enjoyed some regular weeks at Mala Yoga; and continue to temind each other that ‘we have to get back into yoga’. 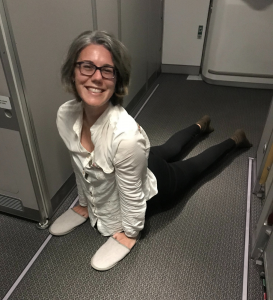 We will be returning to Freo from a holiday Spain, in a week or so and having just stumbled on your advice/ moves to help survive a long flight- I feel far less apprehensive- Claire will curl up and go to sleep as soon as the landing gear is up! Point being, is that we both do shift work and have a young family- we really want to get back to our practice even though our ability to attend ‘regularly’ is infrequent. We are hoping that it is not too late in the year to commit to a course that will allow us to ‘irregularly’ attend and to get back to where we were previously. Look forward to taking this up when we are home. No it's definitely not too late in the year to start - we'd love to connect with yourself and Claire to help put together a program that will suit your practice and commitments.